With the tournament fast approaching, we wanted to take a moment to discuss the benefits of participation. The tournament is a great opportunity to showcase everything that Master Garbowsky has taught us as well as to share our knowledge with other martial artists. Preparing for the event provides us with a goal and a chance to push ourselves to become better. Since our tournament attracts martial artists from various schools it provides us with the opportunity to see other martial art styles and meet new people. To all of the black belts, it is especially important to set a good example by helping our Tang Soo Do family. You can do this by participating as both a competitor and a judge. 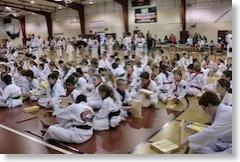 Lower and younger belts will be watching not only your technique, but also your participation while judging. As part of the Tang Soo Do community, it is imperative that we continue to lead by example by providing martial artists with the best possible tournament experience. If you have questions about how you can help, please talk to Master Garbowsky or any of the Technical Advisory Committee members. We need everyone's participation in order for this to be a success!